It seems like a really long time ago that I had this year's Literary Bake-Off with my AP English students. I guess that's a good because next thing you know Labor Day will be here and I'll be back in school. The kids rose to the challenge for this year's bake-off, creating some really amazing baked goods. The assignment asked students to bake something reflecting a work of literature read during high school. The baked good could be a literal or figurative interpretation of the text. Each student had to bring their item on the last day of school and present it to the class before sampling. For my entry, I baked hibiscus cookies to represent the symbol of the purple hibiscus in Chimamanda Ngozi Adiche's novel, Purple Hibiscus. Her novel was one of the best things I've read in a long time and added itself to my list of favorite books. Let's take a look at what my students created, shall we? Any guesses as to what this cake represents? 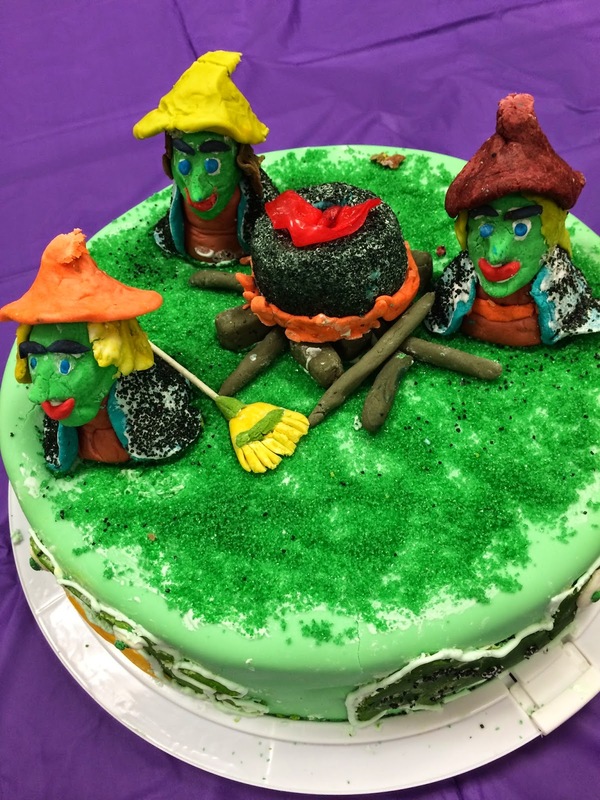 This student braved playing with fondant to create the Weird Sisters from Macbeth. I love the details she used in making the witches and the cauldron. Here's another entry representing Macbeth. The red icing on the nails represented the blood on Lady Macbeth's hands that she tried to wash off during her sleepwalking scene. Frankenstein Rice Krispy Treats anyone? This cake represented the sledding accident in Edith Wharton's novel, Ethan Frome. I loved the detail used for the hill and the sled's tracks. Most of my seniors said The Catcher in the Rye was one of their favorite books read in high school. This student created a cake, with a broken record on top to symbolize the Little Shirley Beans record that Holden buys for his sister and then later drops. Another favorite was The Great Gatsby, which we read junior year. 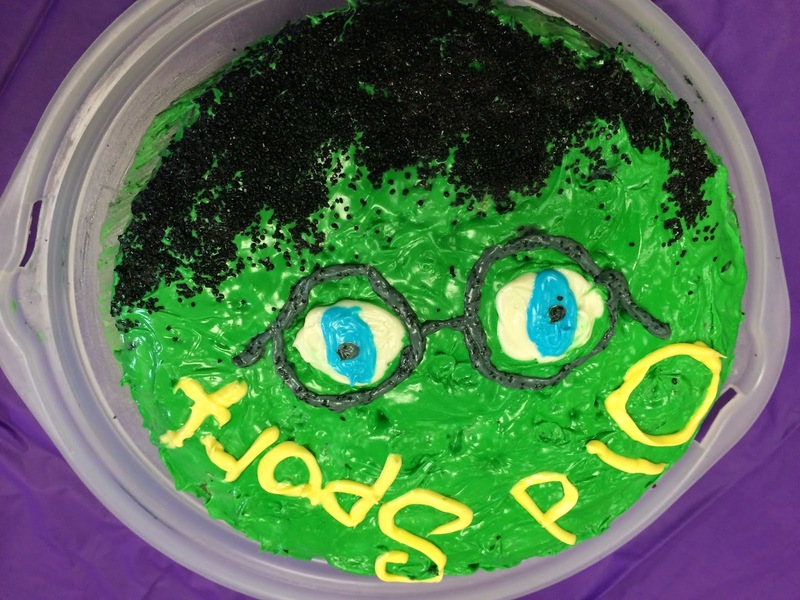 This cake was make to represent the eyes of Dr. T.J. Eckelburg, with green icing symbolizing Gatsby's green light. My co-teacher also made a Gatsby-related entry with his Green Light Pistachio-Cranberry Cookies. They were amazing and I loved the use of the symbolism. Apparently the green color of the cookies came from the use of pistachio pudding, which was added to the batter. With 22 students each bringing in their baked goods, my classroom smelled and looked like a bakery (not a bad thing at all!). Several of my co-workers stopped by to help judge and to try some of the creations. I think my class ended up providing half of the school with cake and other goodies once the contest was over. In the midst of trying to keep the classroom sort of clean and taking pictures, I forgot to tally the judges slips. I ended up telling the class it was a 22-way first place tie. It was a great way to have an end-of-the-year party with an academic slant. For more information on how I run the bake-off, get my handouts and rubric here. You can also see last year's entires and entries from the first year I organized the bake-off.